Who is this Nipuni whom Daham is to marry? News about President's son, Daham Sirisena is to enter into marriage on May 9th came to be known yesterday. It has been confirmed by now that this news is true. 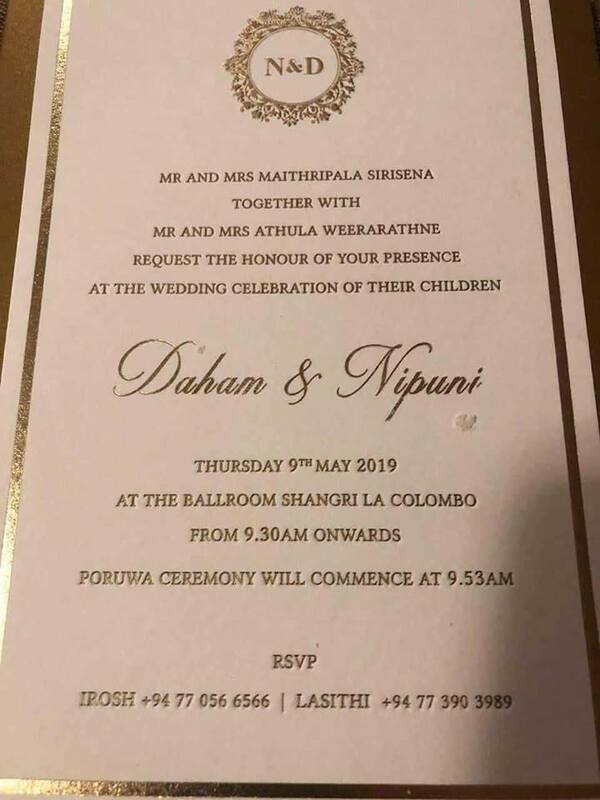 Daham will be getting married to Nipuni Weeraratna whom he had been in romance for sometime. for producing items related to steel. It is mostly popular for production of roller doors. Elcardo factory is situated in Ratmalana Industrial Zone while the main office is at Nawala Narahenpita Road. Nipuni lives in the house down Nugegoda, Railway Avenue. Even during the period Mr. Maithripala Sirisena was preparing to become President, there were connections between the Weeraratna family and Sirisena family. Even while pursuing advanced studies Daham and Nipuni have had a close connection. Nipuni has joined with the family in foreign travel with Daham Sirisena in the past, it was reported. Arrangements have been made to hold the wedding next May 9th at Colombo Shangrila Hotel. All reputed politicians of the country are expected to grace the wedding ceremony of President Maithripala Sirisena family only son Daham. Already some have been sent invitation cards and a copy of that invitation card has been accepted by the social media yesterday. In the meantime most people have checked to find out who Nipuni is and steps have been taken to inactivate her facebook account temporarily from last evening, it came to be known.